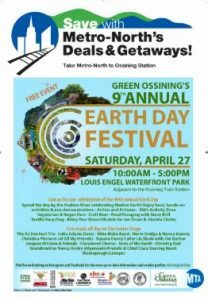 March 19, 2019 Ossining, NY - Green Ossining’s 9th Annual Earth Day Festival at Louis B. Engel Waterfront Park will be on April 27th from 10am-5pm. Join the Greater Ossining community in our annual celebration of Earth Day. Bring family and friends. Learn how to live a more sustainable life, visit artisan vendors, and enjoy food and live music on the banks of the Hudson River.As Westchester County’s largest community-run earth day festival– expecting visitors to exceed 4,000 and 100+ vendors – the Festival has grown from some 300 attendees and 20 vendors in our first year and attracts visitors from as far south as Brooklyn to counties surrounding and north of Westchester. We’re planning to have more hands-on activities and educational opportunities for everyone, as well as continuing great live music and entertainment aiming to make it our best earth day festival yet. “This year, as we celebrate the 49th anniversary of Earth Day, we remain keenly aware of the great challenges affecting our natural environment and our planet overall. We are also of the belief that there is much we can each personally to affect and create a halo of positive change by the everyday choices we have the power to make. With a nod to the importance of sustainable communities, you’ll find many things you love about festivals - food, music, artisans, activities – as well as many environmental solution and advocacy-based organizations all cherry-picked for their local appeal and with an eye on environmental relevance.” said Suzie Ross, Chairperson and founding member, Green Ossining. Stage line-up includes The KJ Denhert Trio, Lydia Adams Davis, Mike Risko Band, Norm Dodge & Nancy Scorcia, Christina Picciano (of All My Friends), Square Dance Caller Liz Slade with Jim Garber, Jacques DiCroce & Friends, Claremont Chorus, Sons of the Earth, Divining Rod, and Grandmother Nancy Andry (Algonquin/French) & Chief Clara Soaring Hawk (Ramapough/Lenape). 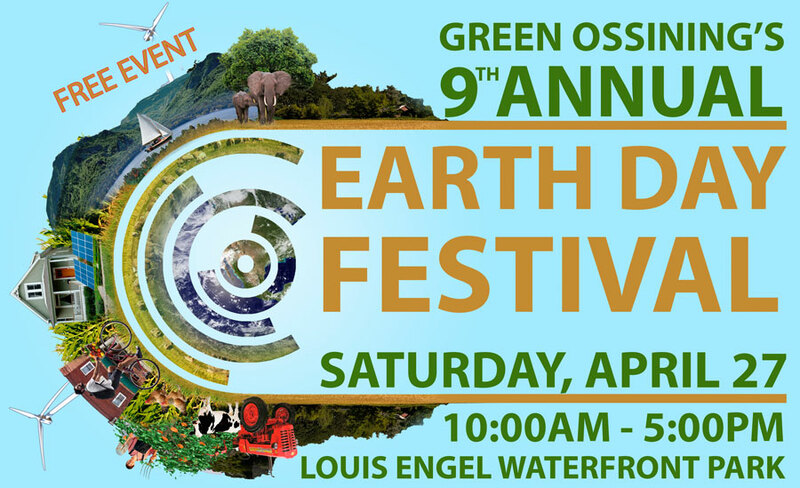 "Ossining is proud to host the largest Earth Day celebration of its kind in the area. 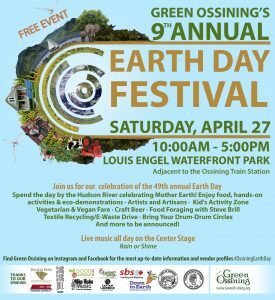 There's no more beautiful place to gather with thousands of people to listen to great music, eat delicious local food, and learn how to better stewards of the earth” said Village of Ossining Mayor, Victoria Gearity. SPECIAL EARTH DAY FESTIVAL OFFER! How about this offer for 50% off of rain barrels and composters? 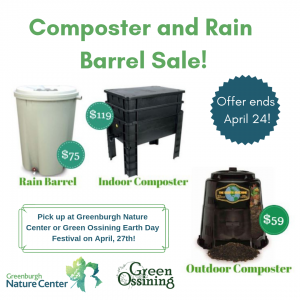 Green Ossining is partnering with Greenburgh Nature Center to bring you a pre-season composter and rain barrel sale which is now live! Get the sustainability equipment you've been thinking of at a great price. Order online by April 24th and pick up at their booth at the Green Ossining's 9th Annual Earth Day Festival on April 27th. The 2019 Earth Day Festival will be held on Saturday, April 27th! EXHIBITOR/VENDOR REGISTRATION IS NOW CLOSED! If you areplanning to be at the Festival as an attendee, please visit us here for important information regarding the Festival (parking, shuttle info etc. ), as well as on Facebook and Instagram where we continue to profile vendors/exhbitors as well. Thank you for your interest in Green Ossining’s 2019 Earth Day Festival. Acceptance of your application entitles vendors to a 10’x10′ space at the event. The Festival takes place on the grounds of Louis Engel Park on the banks of the Hudson River from 10a-5p. Prior to the Festival, you will receive a confirmation letter from Green Ossining reminding you of Festival guidelines and instructions on when/where to unload and park your car. The Festival is hosted and organized by Green Ossining with the assistance of the Town and Village of Ossining. This year’s sponsors include SBS Printing and Shipping, Mike Risko Music, Good Choice Kitchen, Down to Earth Markets, Suburban Carting, Dunkin Kehn, Sing Sing Kill Brewery, Captain Lawrence, and Six Degrees of Separation. Stay tuned for more updates and about other special events happening throughout the day. Follow us on Instagram and Facebook in order to get the most up-to-date information. – Create a forum for those in the community that are concerned about the environment. – Identify ways to promote “green” methods and practices. *Vendors MUST AGREE TO REMAIN operational until the Festival ends at 5:00pm. *Tents are REQUIRED. Green Ossining does not provide tables, chairs or tents. Assigned vendors spaces may be on pavement or lawn areas. Due to the proximity of the park to the Hudson River and potential windy conditions, tents must be secured with sandbags or other weighted anchoring equipment (lawn stakes are not reliable and some vendors may be on pavement surfaces). *No vehicles will be allowed on the lawn area or within the Festival grounds. *Application submission is not an assurance of participation. We reserve the right to select vendors based on variety and whose values are in most in line with our mission “To promote environmental sustainability community-wide, and develop practical methods that protect our natural resources.” Since space is limited, variety of vendors will also be a factor. We will notify you within a week of registration should your application be declined. We ask that you abide by our rules to help make the Earth Day Festival successful for everyone. – Single-Use Plastic Bottles: Water jugs will be available at Green Ossining table for your eco friendly bottle refill. – Mass marketing “give-aways”: Please refrain from offering knickknacks/doodads/trinkets/baubles unless they are functional and associated with Earth Day. Items must be environmentally friendly. Please contact us to be certain that they will be allowable. – Zero Waste: All food vendors must comply with our zero-waste efforts. This means all cutlery/plates/straws/bowls/cups must be compostable or recylable. (If you need a supplier for these items, check out Eco Products, or Greenstaurant.) We request that you encourage and remind each visitor to dispose of all waste at our Zero Waste Station. – Single-Serve Packaged Snacks: The sale of single-serve, packaged snacks (chips, cookies, etc.) is prohibited unless all packaging is compostable. REGISTRATION DEADLINE: March 29, 2019 or before should we reach capacity.